Republished August 4, 2015, 1:00 p.m. to correct the map legend. Algeria is the third-largest oil producer in Africa, after Nigeria and Angola, and the largest natural gas producer in Africa. However, production of both oil and natural gas has declined over the past decade. 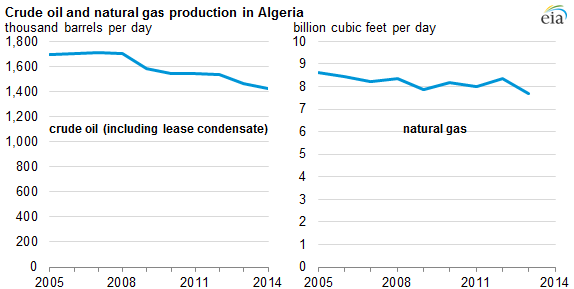 This declining production has led the Algerian government to amend its law regarding foreign investment in hydrocarbons in an attempt to attract the investment and technology improvements needed to help stop production declines. In 2014, the national oil and gas company Sonatrach offered 33 blocks located in four sedimentary basins with high shale gas and oil potential. This auction resulted in Sonatrach signing five contracts with Repsol, Shell, Statoil, and Dragon Oil-Enel. By law, Sonatrach takes a mandatory majority share (at least 51%) of any resulting projects. In May 2014, the Algerian Council of Ministers gave formal approval for foreign partners to join Sonatrach in the exploration and development of shale gas resources. 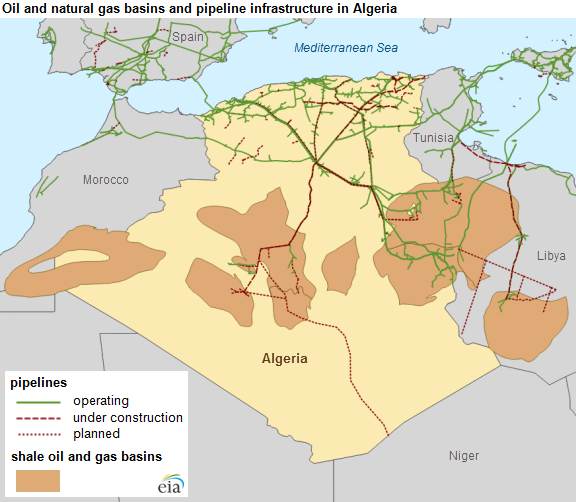 Algeria has large proved crude oil and natural gas reserves and abundant resources that are already connected to world markets through an extensive natural gas pipeline network. In addition, Algeria has a large shipping fleet that sends liquefied natural gas (LNG) from several liquefaction plants to customers in Europe and elsewhere. Proved crude oil reserves totaled 12.2 billion barrels in 2014, with an additional 9.8 billion barrels of undiscovered oil and natural gas liquids (NGL) resources estimated by the U.S. Geological Survey (USGS), and close to 6 billion barrels of technically recoverable shale oil resources estimated by U.S. Energy Information Administration and Advanced Resources International (EIA/ARI). Proved natural gas reserves totaled 159 trillion cubic feet (Tcf) in 2014, with an additional 49 Tcf of undiscovered natural gas resources estimated by USGS and more than 700 Tcf of technically recoverable shale gas resources estimated by EIA/ARI. Early this year, Sonatrach announced plans to spend $64 billion, or 70% of its total investment program from 2015 to 2018, in upstream activities to reverse the decline in crude oil and natural gas production in Algeria. Sonatrach set a target to increase gross hydrocarbon output from 1,429 million barrels of oil equivalent (MMBOE) in 2014 to 1,649 MMBOE by 2019 (from 535 to 616 MMBOE of oil and from 894 to 1,034 MMBOE of natural gas). During the past three years, Sonatrach intensified its exploration activities by drilling 275 oil and natural gas wells and by seismically mapping large areas of the country, with an estimated investment of $30 billion. Sonatrach also conducted its own shale resource assessment and started exploration activities. Sonatrach's first two vertical shale exploratory wells drilled in 2012 confirmed the potential for shale gas. Since 2014, Sonatrach has been engaged in a pilot project in the shale gas-rich Ahnet basin to drill, hydraulically fracture, and analyze three horizontal wells with up to 14 hydraulic fracturing stages. Although the government seeks to reduce the country's dependence on oil and natural gas revenue, it has also made repeated calls for more investment in the sector. However, civil unrest and some opposition to the government's commercialization of shale resources may present obstacles to attracting foreign investment. Security is also a major concern, particularly following the attacks that took place at the Tigantourine natural gas processing plant in January 2013 in Illizi Province, near Algeria's eastern border with Libya.